Tonight’s “Samson And Delilah” ends with a perfect reversal of last week’s conclusion. The previous episode found Stone going down a literal blind alley in pursuit of Duane Reade, the man who really probably is the likeliest suspect in all this. (The man’s weapon of choice is a big knife! Come on!) The crime TV genre has taught us to treat characters like Reade as the boogeyman, the elusive real killer who manages to evade justice until the very last episode. But that’s not what Reade was to Stone, who doesn’t give a crap about justice or the real killer. All he cares about, all he is paid a very decent sum to care about, is reasonable doubt, and Duane Reade represented reasonable doubt. But Reade was always an imperfect candidate for that: His connection with Andrea was murky at best, and he is far too scary an individual for someone to bring in without the help of the police, and it’s pretty obvious the police have no interest in finding alternative suspects. Reade isn’t the boogeyman, because The Night Of isn’t that kind of show, but he did represent the ghost of reasonable doubt, and the look on Stone’s face when he sees Andrea’s stepfather working with his latest older woman client at the gym says it all: At long last, he’s found a way out. He’s found someone onto whom he and Chandra can pile enough suspicion that maybe, just maybe, Naz will beat the rap. I’ve been more or less making this point for a while now, but “Samson And Delilah” underscores this point better than any previous episode: The Night Of is at its best when it feels least like a TV show. Most of the time, “a TV show” means something like Law And Order—indeed, series writer Richard Price described the series as “the anti-Law And Order” in a recent interview with The A.V. Club. 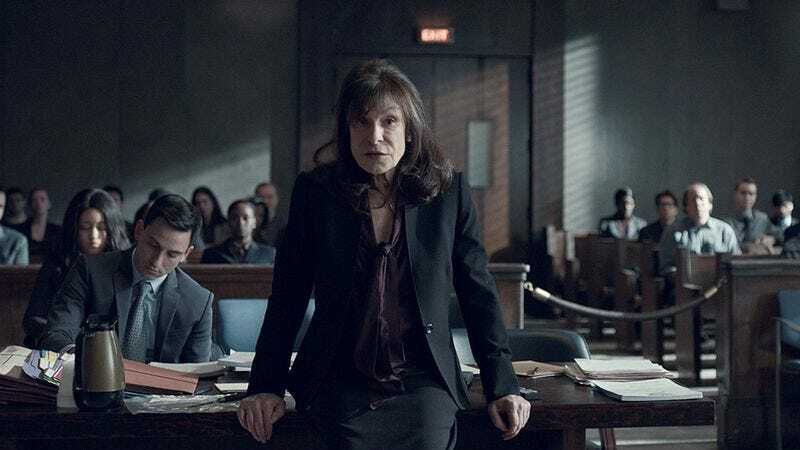 And yes, Law And Order and other broadcast network crime procedurals have their tropes, many of which are expertly defied and subverted in tonight’s episode as the trial begins. In particular, Jeannie Berlin really comes into her own here tonight as Helen Weiss. Her courtroom manner is an effective strategy, but it’s so damn obviously a strategy. Weiss calibrates her performance so that it’s a shade over-rehearsed and more than a touch too melodramatic. This isn’t Sam Waterston as Jack McCoy, a terrific actor playing a terrific lawyer who delivered his every speech as though the survival of the entire criminal justice system depended on it. Weiss’s case is that of a lawyer who is at best pretty good, one who didn’t necessarily plan to take this case to trial and has a slightly hackneyed but probably successful plan to ease into the win. Details like those are still what make The Night Of feel special, so it’s surprising how much of “Samson And Delilah” feel like an ordinary television show. Not like a Law And Order, mind you: This episode recalls more prestigious fare, but it still feels derivative in a way that the show at its best doesn’t. The Night Of lets its True Detective flag fly with the visit to the coroner, whose innocuous-seeming interaction with Andrea—sure he was a bit of a jerk to tell her off like that, but she was smoking in a gas station!—now becomes part of a bizarre misogynistic mythology, one where he appeared mere seconds away from going full General Ripper and talking about fluoride and the purity of essence. I’m still not entirely sure what to make of that scene, as it feels entirely plausible he won’t return. Perhaps his presence is best understood not on his own terms but rather in relation to Chandra, who moves into a three-way tie for protagonist status here with Naz and Stone. Her visit to the mortician is another reminder of just how in over her head she is. What’s weird about that though is that most of what challenges her here are the nuts and bolts of being a trial lawyer in a murder trial, whereas this experience doesn’t have that same verisimilitude. The mortician’s entire worldview feels like something out of a TV show—it’s interesting to see how a relatively “real” character like Chandra would react to such a creepy experience, but it doesn’t really gel with her experiences elsewhere in the episode. The only other moment that fits a little bit is when she tries to open up about her breakup to Stone, who shuts her down and points out they have actually important things to worry about. In theory, it’s a good moment to have a character be reminded that their personal dramas, while certainly important to them, are of no consequence in this context. But it’s hard to really buy into that when it’s Stone, he of the endless (but now actually maybe possibly ended) eczema subplot, doing the reminding, and indeed he offers some pat advice about how none of these personal problems are ever the end of the world. All this sounds more negative than I mean it to, as “Samson And Delilah” is a perfectly good episode, and it’s not even so much a stepdown from anything else The Night Of has done. There’s a fine line between being meditative and just being slow, and I’d say “Samson And Delilah” errs toward the latter. That’s in part because Chandra just isn’t a detailed enough character to support as much of the episode’s focus as she gets, through no fault of Amara Karan’s performance. It’s a shame the episode largely skips over the jury selection process, which sure feels like it would be a terrific subject for The Night Of’s naturalistic focus. “Samson And Delilah” feels like the show pausing to take a long look at its characters and where they stand as the trial begins, and a reflective character piece just doesn’t play to The Night Of’s strengths as a granularly detailed procedural. The big exceptions here are the Khans, whose situations are so naturally pathos-evoking—and whose actors are so good in their small roles—that we only need brief glimpses of Naz’s mother struggling with cleaning equipment or a humiliated Naz’s dad realizing just who he has delivered takeout to realize just how much the case has already destroyed them. That just leaves Naz himself, whose story continues to progress more or less exactly as one might guess it would. Again, that isn’t a knock: Other parts of The Night Of work because of their specificity, but Naz’s transformation into a proper convict benefits for its universality. His altercation with another member of Freddy’s crew builds on his experiences last week with the smuggled drugs: Freddy can indeed offer security, even comfort at Rikers, but it’s all just so damn tenuous. Freddy might not be totally wrong when he intimates to Naz that life inside Rikers isn’t really that much worse than life on the outside, in part because Naz has a clearer sense of himself than he did when he had his freedom. But that clarity is just the byproduct of there being no margin for error, with every wrong step and misplaced glance potentially proving fatal. Naz is adapting as best he can, to the point that it’s undermining Chandra and Stone’s efforts to exonerate him, but his life expectancy still doesn’t seem that much longer than it was when he first came to Rikers. Naz’s late-night call to Chandra is a great distillation of how impossible his situation is. For all he has carved out for himself, and as much as Freddy might actually on some level be akin to a friend, there’s no one he can trust on the inside and no one he can relate to on the outside. 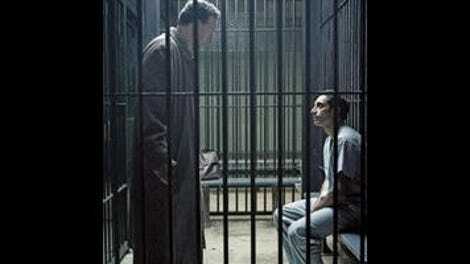 Whatever happens at the trial, there’s just no good way forward for Naz. One great detail is the bit about Naz wearing the wrong color of shirt, with Stone and Freddy both recognizing that he needs to wear a white shirt to his trial. The motivation for Naz turning down the offer is also intriguing: Does he remain wary of Freddy, or this one last effort to remain connected with his parents? Either way, I’m guessing he won’t make the same decision a second time. I’m sorry for mentioning the eczema subplot again when I said I’d give it a rest, but hey, at least it was to mark its possible conclusion! And just for the record, I’ll put as succinctly as possible why I’ve never cared for it: To spend that much time with Stone only makes sense if he’s the show’s protagonist, and I’ve never felt The Night Of has offered a good argument for why he should stand out from the ensemble in that way. It just feels like misplaced time that could be spent more on the particulars of the case. But hey, the rest of the show is more than good enough to compensate.